Turning the Corner focuses on using woodturning on the lathe as a way of enhancing cabinetry, furniture designs, and architectural installations. Each article also suggests an important woodworking book to read, reread or listen to, and a link to an appropriate article in The Highland Woodturner. 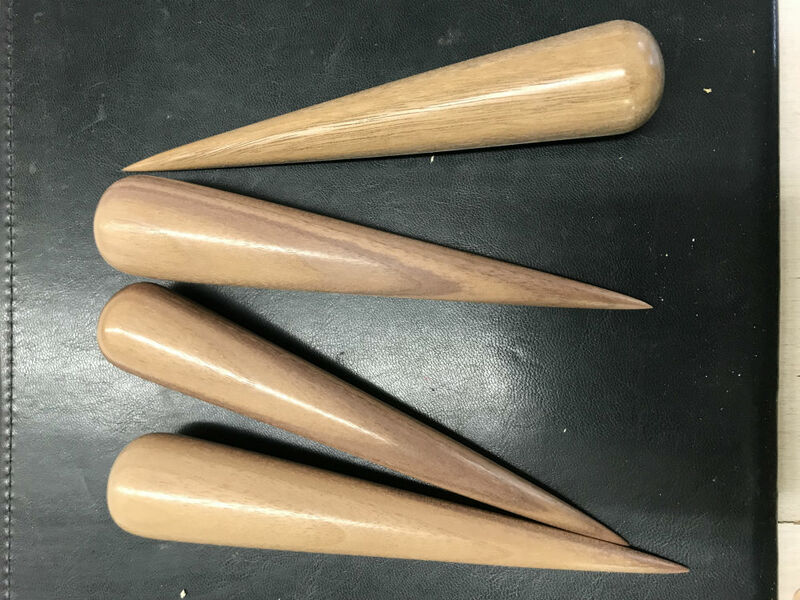 Along the way, these articles seek to inspire woodworkers (cabinetmakers, carpenters, and housewrights) to extend their skills into basic, novice, and advanced woodturning while discovering for themselves this particularly sensual and spiritually rewarding dimension of working with wood. 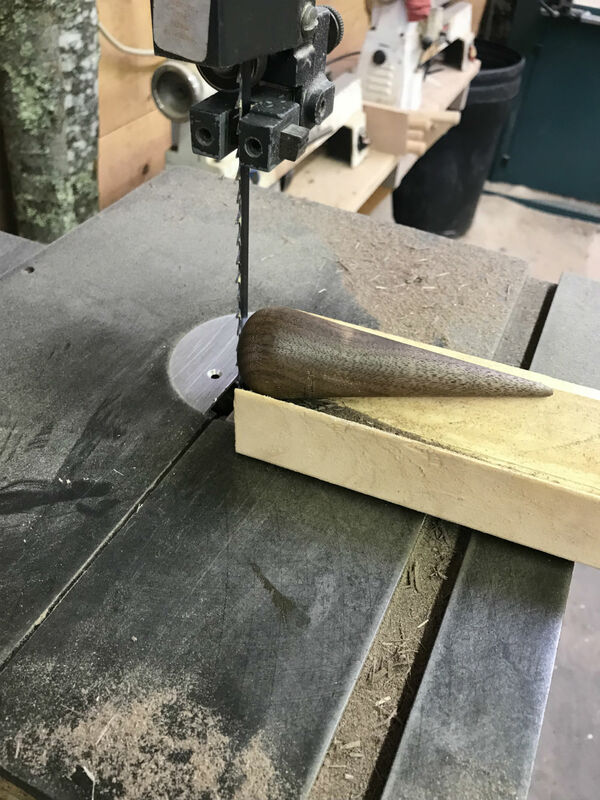 In my experience, many woodworkers are approached by a family member or friend asking them to make a gift for some special occasion. 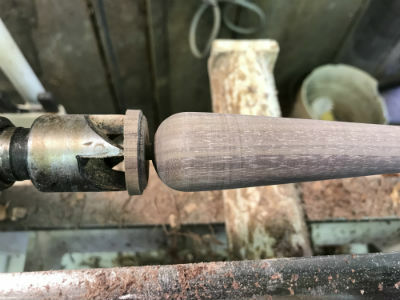 Perhaps the most frequent request for a woodturner is to make a gavel to recognize a newly appointed judge or elected leader. Sometimes the request leads to developing a new kind of gift that expands the conversation and offers an opportunity to approach the task with some creativity. In the Spring of 2018, the Master of Schooner Bowdoin, Captain Will McLane, approached me before his planned summer sailing trip to the north seeking a collection of potential small memento gifts that he could take along and give to various other mariners and port officials that they might meet along their travels. In the course of our conversation, we decided on making a series of fids – a small, easily carried, useful, and especially recognizable mariner-oriented kind of gift that allows the person to open the weave of a line (rope) in the course of splicing. 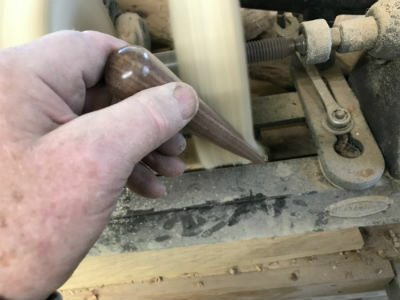 The challenge to the turner, of course, is to turn the blank with an even taper, a soft, fully rounded "palm" ball on the end, and a pointed but not sharp working end. 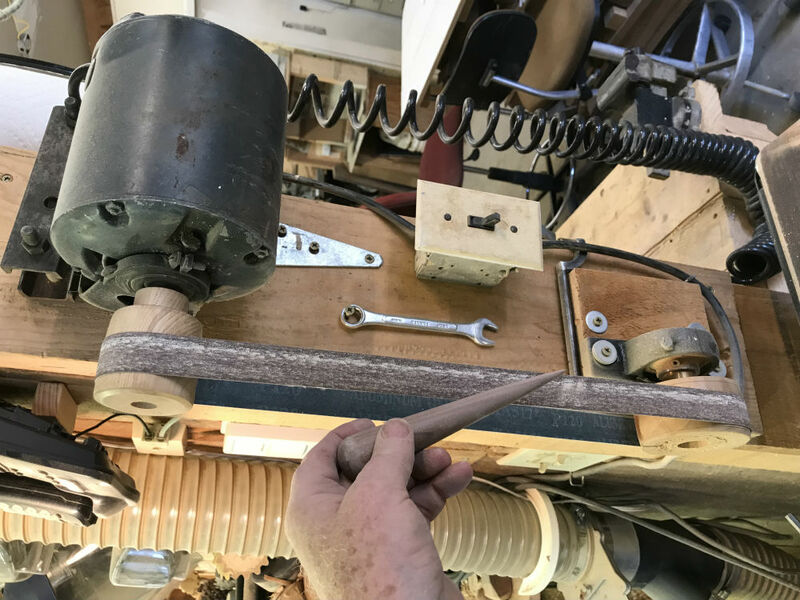 Clearly there is no way to hold the blank while turning, and the end-goal is for a seamlessly smooth tool that is kind to both the hands and the lines being spliced. 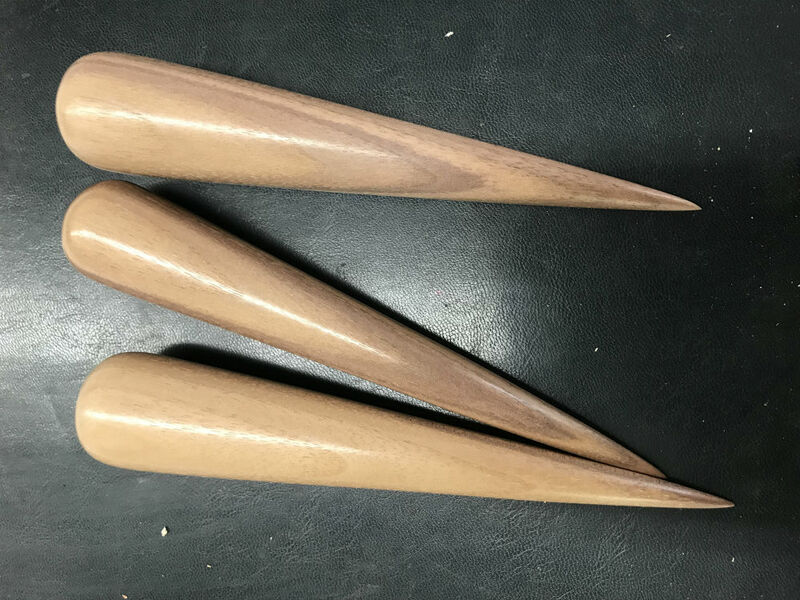 Hard wood – walnut, oak, cherry, mesquite, hornbeam, locust – innately allows for the strong, smooth, and well-finished tool. 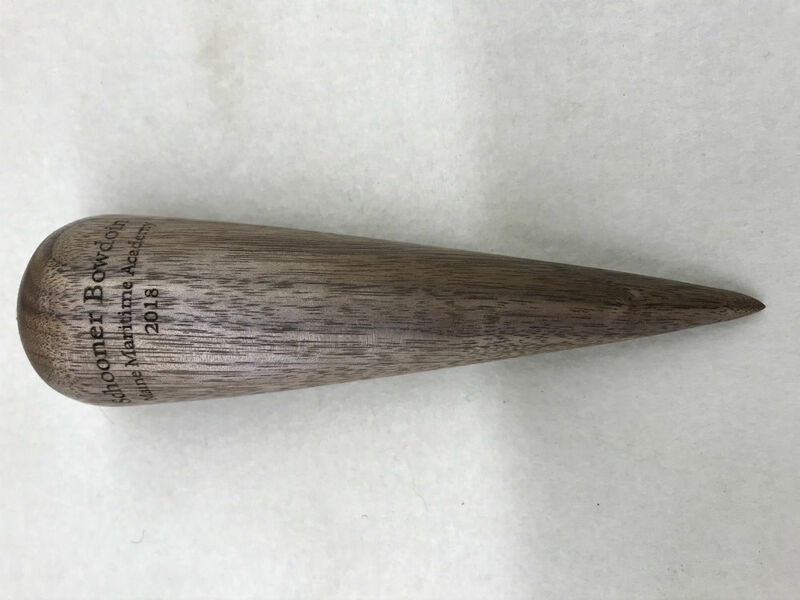 While initially the finish might be friction polish or oil, an oft-used fid will ultimately shine with the natural oils of being handled. 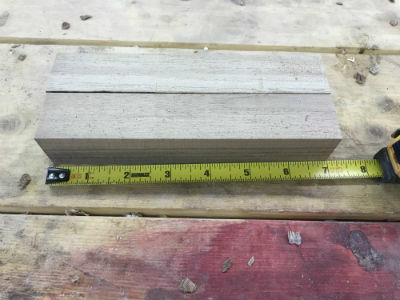 Begin with a squared blank approximately 1.5" X 7" for this project. 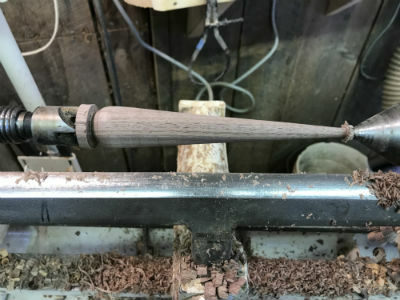 This will work on the most common small and medium-sized lines. Mount the block between centers with the tool rest at the mid-point. Turn a waste section on the headstock end where the larger diameter (mass) will be located. Planning the turning with the greater weight (mass) of a piece toward the headstock ensures minimal chatter. Rule #2 is "Turn from large diameter toward small" or "downhill" always. Using adjustable calipers to achieve a diameter helps make multiple pieces uniform. 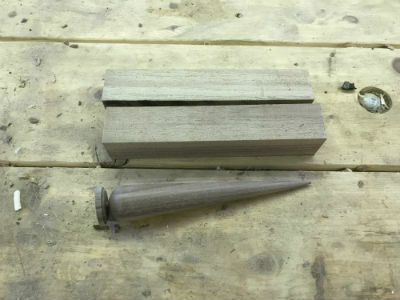 The waste block is an excellent aid to hand and eye in setting the largest diameter of the fid. With the blank roughed to a taper, smooth and bring to final straight-tapered shape with a skew chisel. 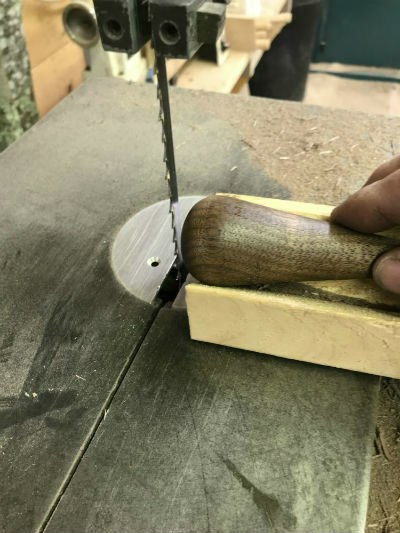 Smooth is the goal, and this exercise with its steady taper is an excellent opportunity to "Keep the bevel rubbing" (Rule #1) with the skew chisel. With the diameter quite small on the right (tailstock), establish a waste block for that end. 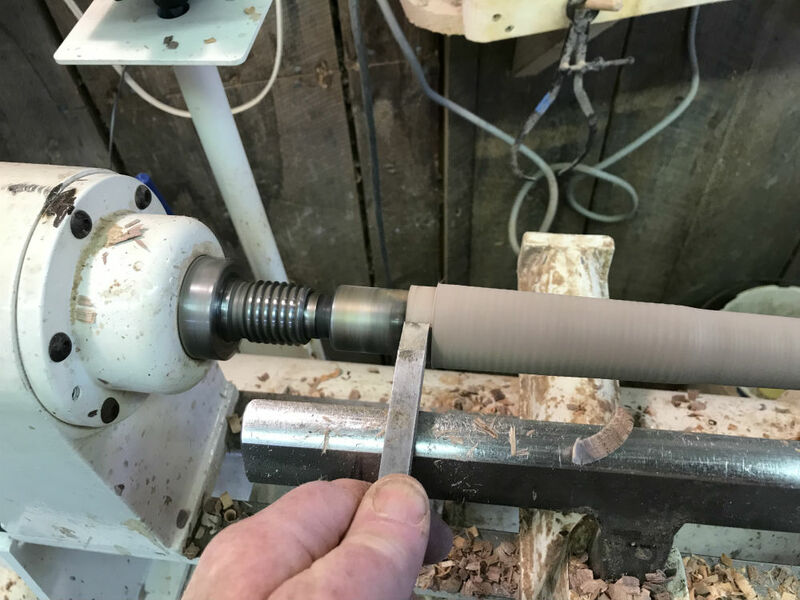 This will allow the turner to reduce the pointed end to a minimal diameter. 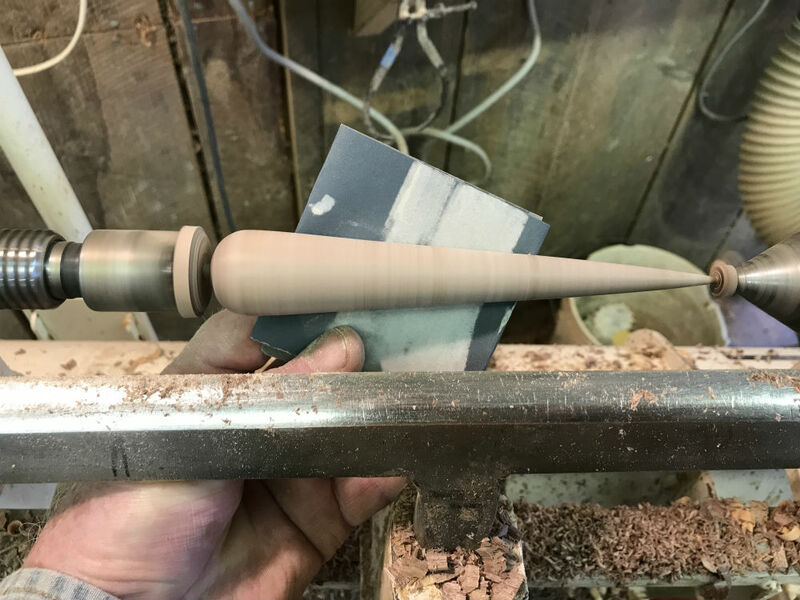 Refine the narrow, pointed end first. Using the lower heel of the skew or a 3/8" beading/parting tool, roll the bead for the top (remember this is a smooth, comfort contact section to fit the palm) to as nearly as small but not quite as small as the holding tenon on the right. 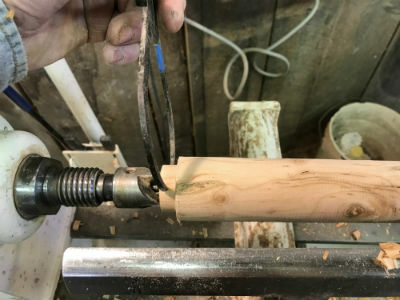 Because this is the power side, the tenon on the left (power/headstock) must remain a larger diameter than on the right (tailstock) or the turner risks having the left tenon twist free. 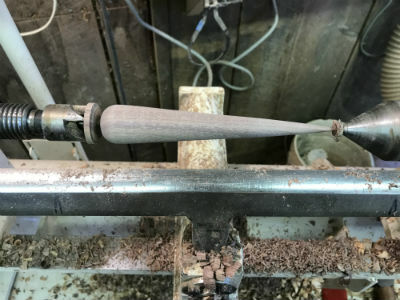 This is also why the turner wants to work the final small tenon on the right before reducing the tenon on the left (Rule #3: Work on the right at a given diameter before working on the left). Sand under power to the 600 or higher desired. A useful fid is one that slips between the braids of a line smoothly without bruising the line. 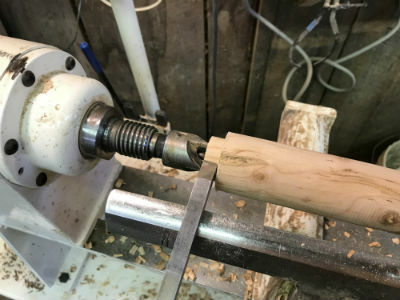 After removing the fid from the lathe, use a "vee" block to carefully saw off the upper and lower waste blocks leaving the tenons proud (protruding). 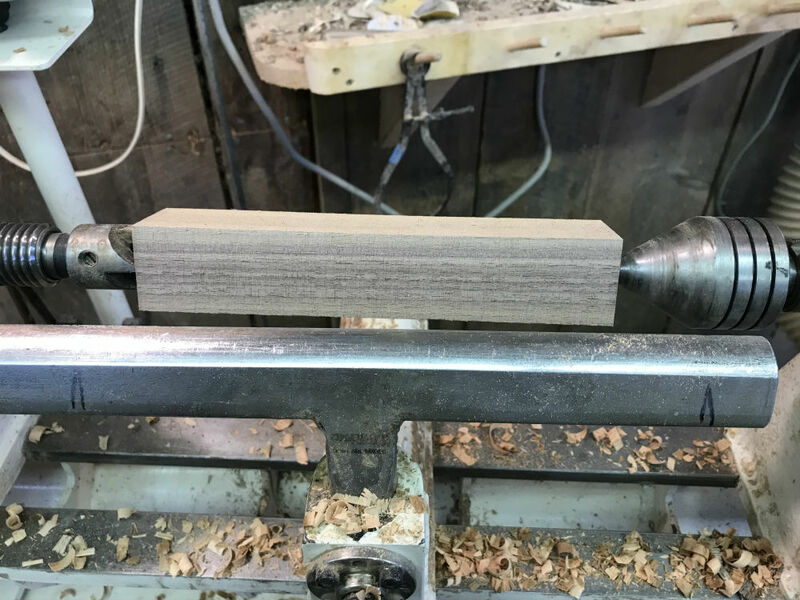 The vee block is especially helpful when turning a round object using a bandsaw because it keeps the turner’s hands away from the blade and stabilizes the work while cutting. Sand the tapered end to a dull point. 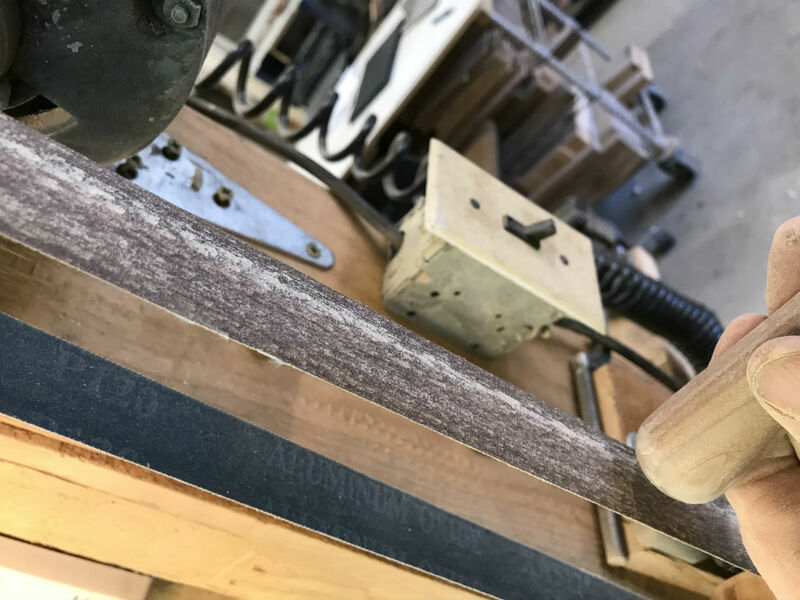 The goal is to slide smoothly between the twisted sections of line to separate them without cutting or otherwise damaging them. This shop-made sanding arrangement uses a typical 120 grit 1" X 42" belt mounted between two hand-turned pulleys. With the pulleys slightly crowned (larger in the middle than on the ends), the tightened belt will track smoothly. Deliberately there is no "backing" section such as might be found on commercial models. 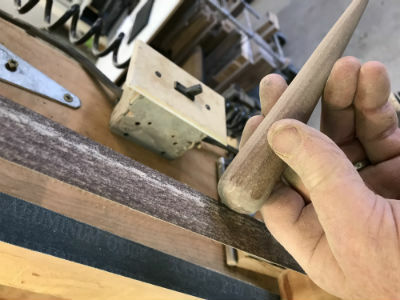 This allows a great degree of belt flexibility during the powered sanding and avoids flattening round objects such as fids, mallet faces, and bowls. With the remainder of the waste-tenon removed, a light touch on the flexible belt followed by hand sanding brings the rounded palm-grip nearly to finish. Final polishing using the Beall Wood Buff Kit. 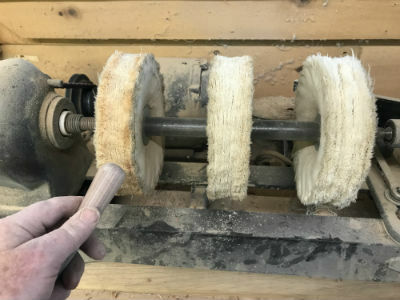 The polishing wax adds to the sensual smoothness of the tool making it both efficient and pleasing to use. 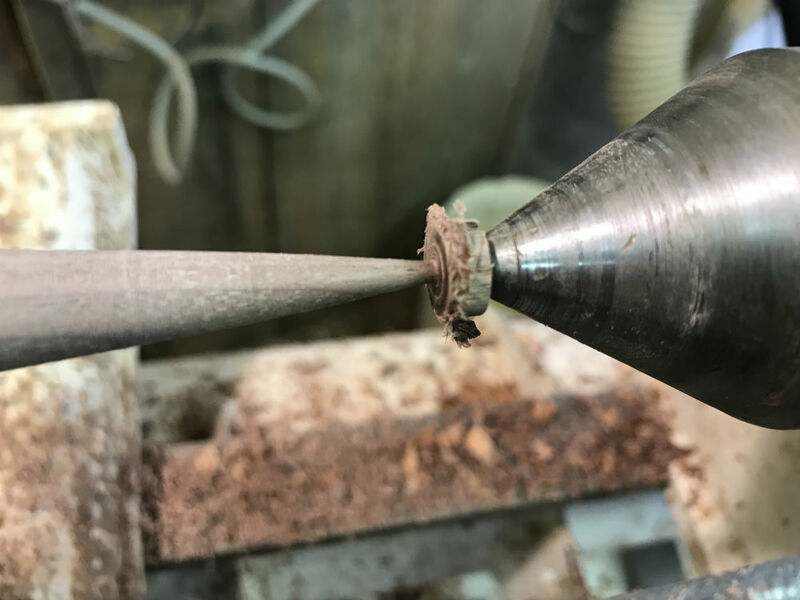 Making a series of fids offers a rewarding experience in making multiples and in challenging the turner to produce consistent sizes and tapers. These make wonderful gifts. 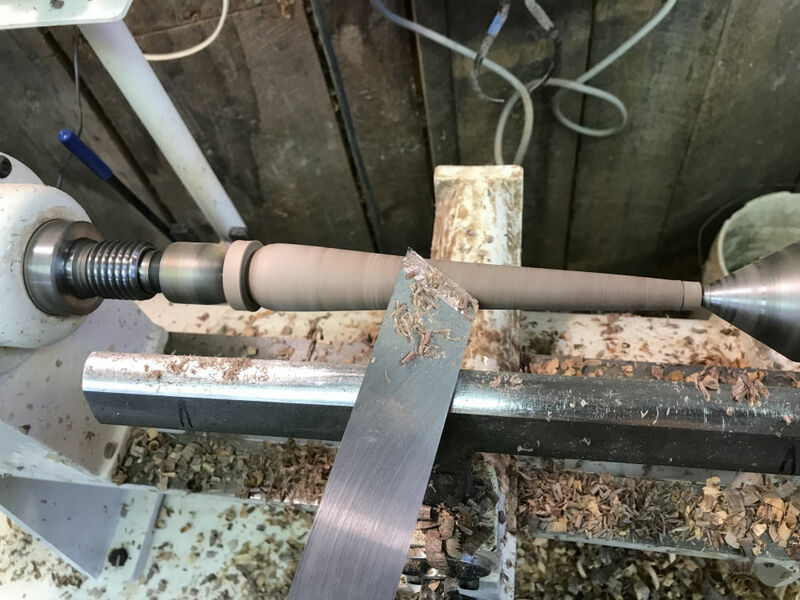 Given the typical turning time of about 3 minutes per fid blank, these tools can be handy, useful, utilitarian supports and sacrificial, wedge-type spacers for a great number of other applications. 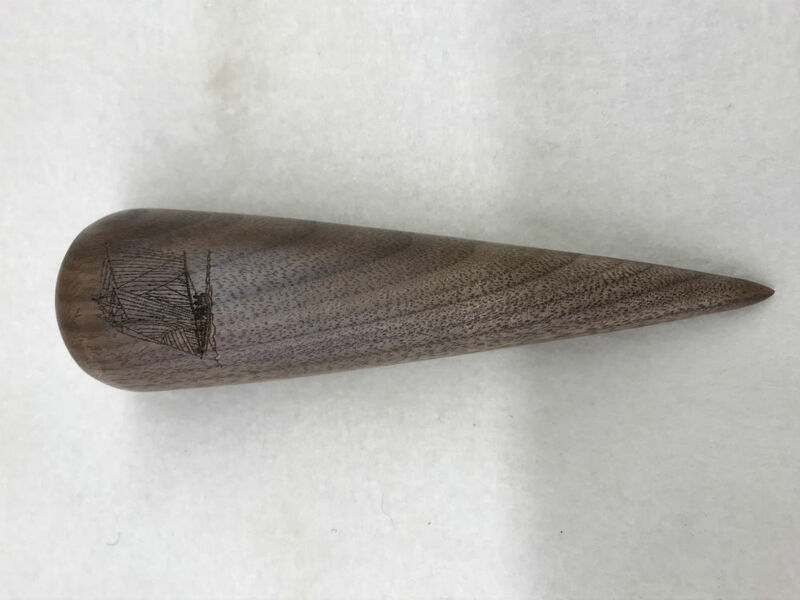 This past Summer, while doing my usual living history woodturning demonstrations at the Wilson Museum, a young lady of about 12 came to me with one of my fids from the Bowdoin in her hand. She asked what it was, and I explained using several spliced lines we have in the shop for our use and to visually show an example. The young lady gave this some thought and then asked how much that fid would cost her. I responded that if she bought it, it would cost $20 but if she promised to learn how to splice with it, she could earn it for free. After further thought, she opted for "free" and promised to learn to splice. Three days later at my next demonstration, she reappeared and proudly showed me her new eye-splice. She and her dad had worked on a piece of line using YouTube and she had done a nice job of splicing. I think I was as happy as she was. Length, diameter, and hardwood species can all be varied. In general, for the classes and convenient typical line splicing job, a fid of about 1-1/2" X 6" works well. 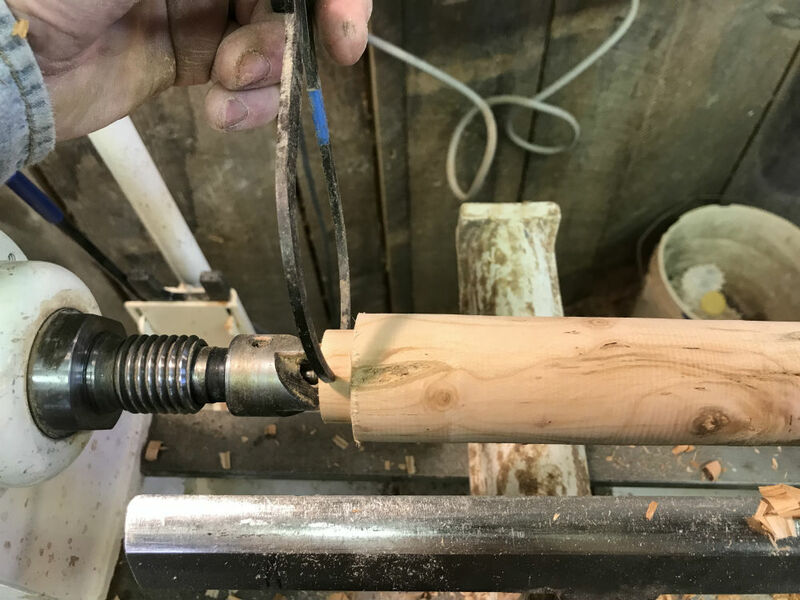 Splicing lines smaller than 1/2" would be easier with a long, thinner fid; splicing lines of 1" or larger require a longer, larger diameter fid. 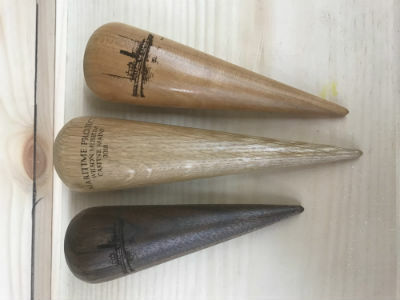 According to Captain Will McLane of the Bowdoin, the fids were popular gifts-of-port wherever they visited. Clearly the time spent making them was turning time well spent and hopefully the mariners fortunate enough to have one would both value and use them. For the broader group of woodworkers, this method works well for turning finials, particularly those that will be carved to a flame or have a long, thin pointed end for a wide variety of furniture pieces. 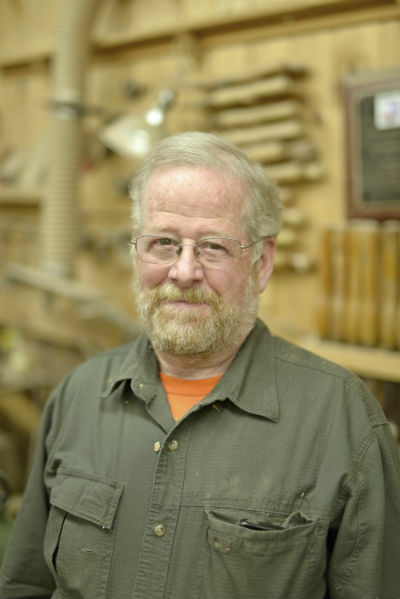 This month's book recommendation to read or inspiring re-read: Wood Design by Donald Wilcox. 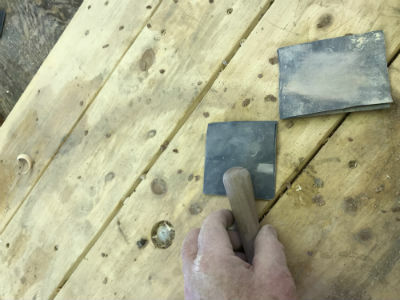 Article link: Tuning the Skew: Practice the Essential Skills. 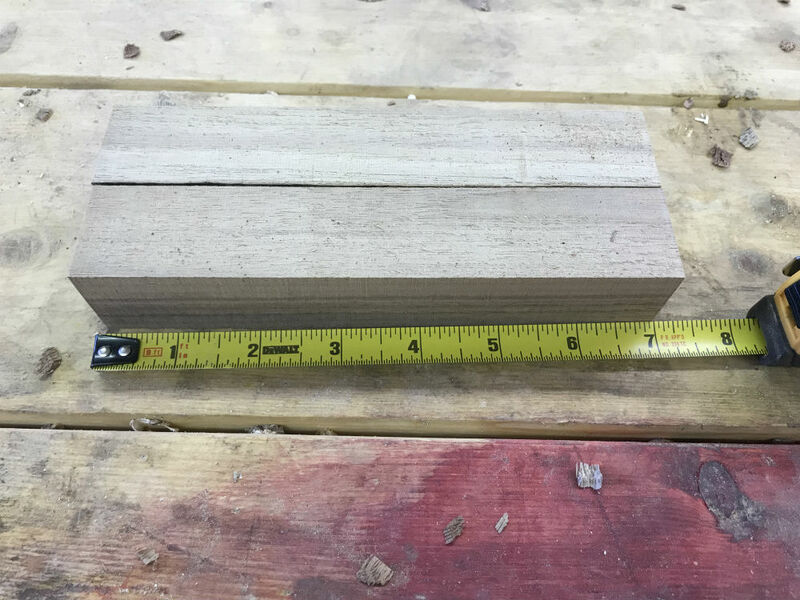 Copyright © 2019 Highland Hardware, Inc.